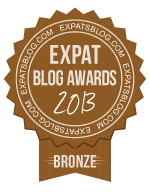 ExpatsBlog.com Expat Blog Awards 2013: China Bronze Award! Thanks for listing my blog! I hope anyone interested in hearing about life in the sticks of China will check it out. I have read with great interest your blog and the 9 things about China life. You are doing a great job the best I can tell from the aspect of one that has only spent 9 days in China on a recruitment trip. I certainly experienced the spitting and hacking and can attest to that practice. It appears that I am going to be bid to assist the Operator Training department in Haiyang and would be living in the Expert (Expat) village. I would like to go into this adventure with some knowledge and am curious if I can bother you for some information on the actual apartments and accommodations available while I still have time to negotiate. Our interest would be specific to furnishings, linens, kitchen supplies, clothes care, housekeeping, medical access, food shopping, TV, internet, etc. Any information would be appreciated. I had the opportunity to see the facility but only from the outside gate, nothing on the inside. Anything would help. Thanks.